Postman provides a strong API development toolchain that integrates seamlessly with the developer's workflow. Postman has always supported an open ecosystem. We work with industry leaders to introduce new features and integrations that make API development easier and faster. Organizations use the term "integration" inclusively, sometimes overly so. In fact, different teams in the same organization might use the term in different ways. Postman views "integrations" as a way to share data or functionality between Postman and other tools that you might use for API development. When manually importing and exporting data from one application to another becomes a chore, an integration can help. For example, suppose you use GitHub for your repository management and use Postman to develop and test your APIs. If you want to save your Postman Collections to a GitHub repository, you can use the Postman to GitHub integration feature. Postman Pro users can currently access over a dozen of the most requested 3rd party integrations in the Postman Integrations directory, with more being released every month. 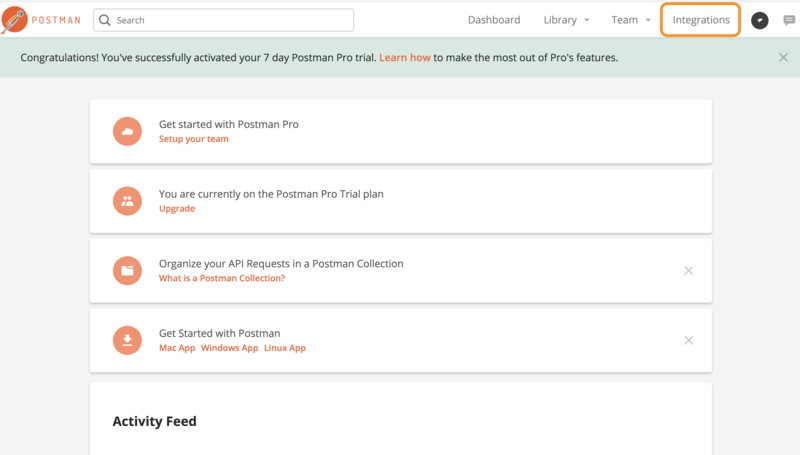 You can access Postman Pro integrations in the Dashboard. In the Dashboard page, click "Integrations". The Integrations page lists all the currently available integrations for Postman Pro users.